One study tracked 17,000 people for an average of twelve years and found that there was a significant correlation between time spent sitting and mortality from all causes, cardiovascular disease and cancer. There are other studies, like this one with 222,000 subjects, that came to similar conclusions. It is important to note that this data is correlational in nature, which means that it does not imply causation, but it is an interesting relationship nonetheless. One study found that standing resulted in a 43% improvement in blood glucose excursion after a meal as compared to sitting. The same study also found that people who stood at their desk burned 174 more calories over the course of an afternoon than people who sat at their desk. One company found that using standing desks increased their employees’ productivity by ten percent, in addition to anecdotal reports of increased energy and better concentration. So, there’s evidence suggesting that there are legitimate reasons why standing might be better for you than sitting. But, as this post’s title suggests, I’ve become an even bigger fan of the treadmill desk since I started using it at the beginning of this summer. As you might be able to guess, a treadmill desk is a desk with a treadmill, which allows you to walk as you use your computer. And, as I’ve had to tell almost everyone who learns that I work on my computer while I walk on a treadmill, it’s not that hard to do. I don’t make typos, fall over and injure myself, or experience any other inconveniences. In fact, I usually feel more focused and energized when I work on my treadmill than when I work at a normal desk. I’ve found it easier for me to get into a “flow” when I work on the treadmill, so that when an hour goes by I feel better than when I started. And while I must confess that it doesn’t necessarily make schoolwork fun, it might make it less unpleasant. On some days, I’ve used the treadmill desk for five or more hours, though that’s something I’ve had to work up to doing. In this study, workers used a treadmill desk for a year. The results showed that participants experienced significant, though modest, weight loss (an average of 1.4kg), although obese participants did have the greatest average weight loss (mean 2.3kg). Participants also showed significant improvements in systolic blood pressure and HDL cholesterol. A study found, as you might expect, that workers burned significantly more calories while walking at their desk than while sitting. This meta-analysis found that pedometer-based walking intervention programs “result in a modest amount of weight loss.” The analysis included 9 studies, with a total of 307 participants and a duration range from 4 weeks to 1 year (median 16 weeks). The pooled estimate of mean weight change from all 9 studies was roughly 2.8 pounds, though they noted that the longer programs produced more weight loss than the shorter programs. 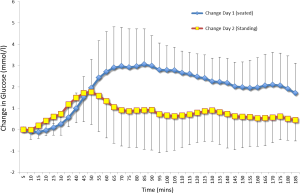 This study on 10 inactive adults age 60 or older (mean age was 69) who had a BMI greater than 30 (Class I obesity) found that a 15-minute postprandial (i.e., after a meal) walk regimen and a regimen consisting of 45 minute walks in the morning and afternoon both improved 24-hour glucose control when compared to a control day during which the participants didn’t exercise. 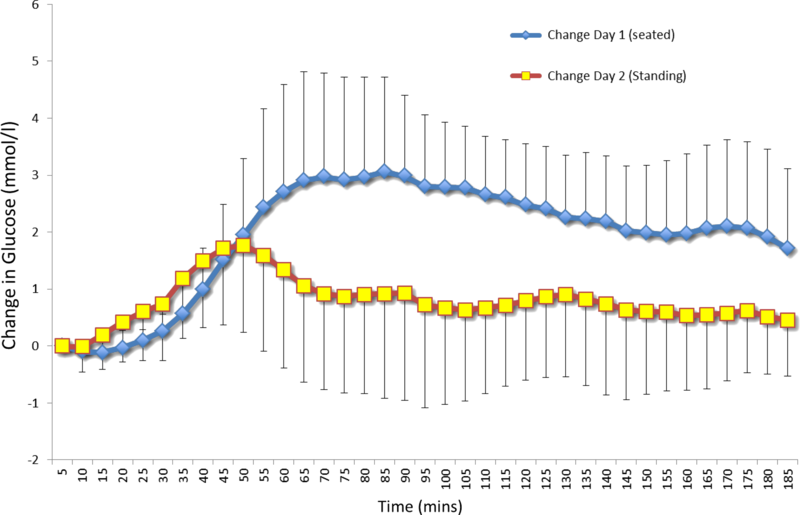 The postprandial walks had the added benefit of reducing both post-lunch and post-dinner glucose concentrations (3 hours after meal) when compared to control days. If you’re interested in actually having your own treadmill desk, then I highly recommend visiting Treadmill Desk Diary. That’s where I learned how to build my own treadmill desk that met my needs, which were that it be 1) inexpensive, 2) not take up much space and 3) not a pain to put together. The instructions on the website are easy to follow and the author’s narrative of his own experience–he lost 11 pounds without changing anything other than walking or standing while working–is an interesting read. So far, I’ve had a very positive experience with my treadmill desk and recommend it to anyone that’s considering having their own. If you have any questions about it, then let us know. Including the desk, this setup costs about $250 (goofy guy not included). ← Are High Reps or Low Reps Better for Hypertrophy? Recent Research Says Neither, Sort of. Great article! Could you tell me a little more about the best type of treadmill to use for this type of desk setup or what to look for in a budget friendly option? I have many clients who would be interested and would love to point them to your site and give them some setup info. I hope that helps. If you have any other questions, I’d be happy to answer them.